It’s cherry season! The last few weeks I’ve been eyeing the tart cherries at the farmers market. After eating about 2 pounds of sweet cherries after a 4th of July trip to Traverse City, MI. I decided it was time for me to try tart cherries – they taste like crap uncooked. Time to create some recipes! 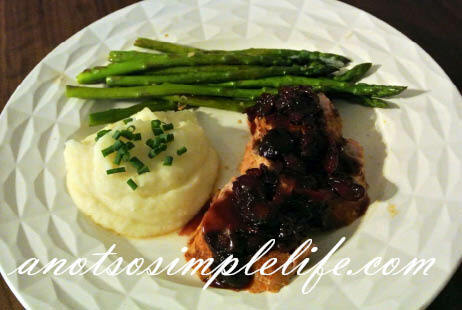 My first, a sweet and savory Pork Tenderloin with a Tart Cherry Sauce. This turned out AMAZING! In fact, my husband and I liked it so much that I’ve decided to can some tart cherry jam and freeze some tart cherries to we can make it later on in the year. It would be a great gluten free, soy free, dairy free fall dinner! Add chicken broth to the pan with the onions that you seared the pork in. Stir, scraping brown bits off the bottom of the pan. Add tart cherries and balsamic vinegar. Bring to a boil, lower heat and then simmer for about 5 minutes. Add tart cherry preserves. Mix 1 Tbsp of water with 1 Tbsp of cornstarch, whisk into the sauce. Let the sauce simmer/thicken for about 2 minutes. Take out the pork and let it rest about 10 minutes before slicing. 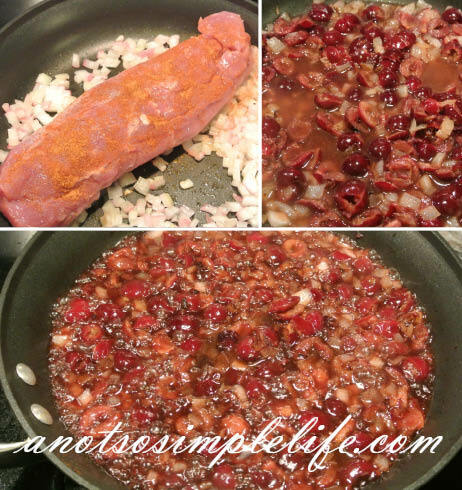 Slice, top with tart cherry sauce, and enjoy!